making: ROBYN'S FETISH CHALLENGE # 206 "EASTER"
Good Morning!! I'm seeing sun and it is beautiful. Just wish the temperature would corporate with the sun. I have some great news to tell you all this week. My daughter who is always on the A & B honor roll made it on the all A honor roll. This is a bright girl that does her homework on her own. We never have to ask her to do it. We always had to with the two boys. My boys are a little mad when I talk about her grades. They were never interested in school so I'm glad they went to career centers their junior and senior year. It payed off because they both have good jobs. You still have to give that congratulations to her and I'm so proud of you. She told me yesterday that she would like to go to college in Florida and I said no way. She then says if she gets a scholarship to go to one down there that there is nothing I could do about it. You have to go where you get the scholarship is. There still is no way. She has four years for me to change her mind. Well, lets get to the challenge at hand. 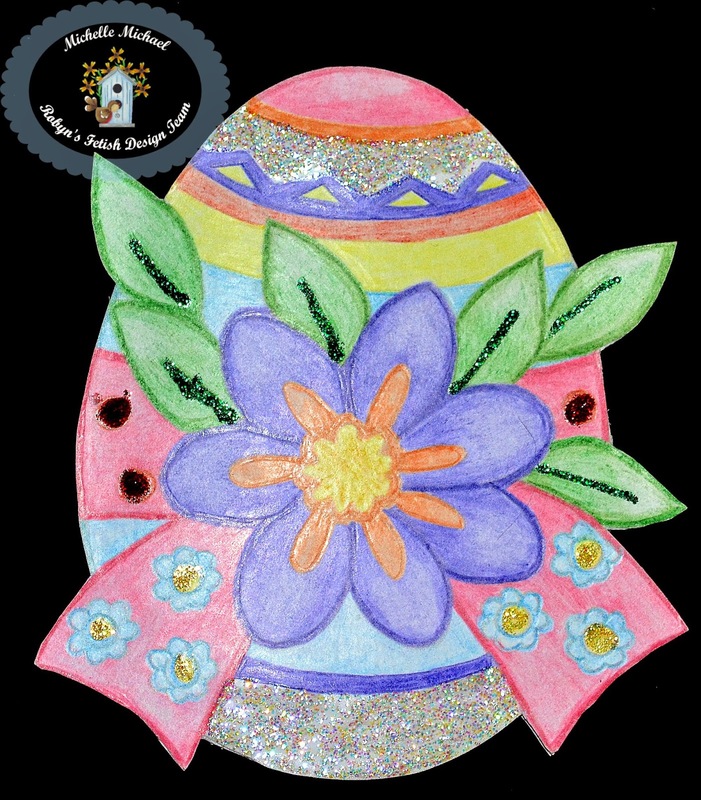 We are all doing Easter cards and we are getting our images from The GreatRobyn is our sponsor for this week's challenge. She always has great images to work with. The image I chose this week is called Easter Egg. I seen this and thought of a cute card. Cut the card out as an Easter Card. I only did something like this once before so I thought it would be fun to do again. Here is the prize that she will be giving the lucky winner this week. This is a great and generous prize from Robyn. Now let me show you my shape Easter egg card. How do you think it turned out? I think the glitter really set it off. It just seemed to plain without it. I really liked the shape of the card. Just something that's different then I usually make. Here are the items that I made this with. Not many items but it did the job. Well, it's time for me to go and do some cleaning around the house. Please go to Robyn's Fetish Challenge Blog and see the cards that the rest of our Design Team Made. Post your entries there also. Have a wonderful Sunday and a great week. I'm going to try to.